Like everyone else, we here at Westbury Toyota have been on the edge of our seats awaiting details about the 2020 Supra. An ambitious reemergence for an iconic sports car that’s been on hiatus for 17 years, the newest Supra was finally revealed to live up to the considerable hype surrounding it. There’s so much to love about this rear-wheel drive sports car that we aren’t really sure where to start. We do know that the wait was definitely worth it, and we’re eager to share with you everything we know so that you can be as amped up about the Supra as we are! The 2020 Supra is a little more compact than others in its class with a length of 172.5 inches, but this gives it the ideal 50:50 weight distribution, an impressively low center of gravity, as well as front and rear overhangs that are markedly shorter. The wheelbase comes in at 97.2 inches. The chassis for this car was developed in tandem by both Toyota and Gazoo Racing. Typical to cars in this class, there’s a rear multi-link suspension. In the front, however, there’s a double-joint spring strut suspension that’s quite unique. All trim levels of the 2020 Supra come with a standard adaptive variable suspension that comes with two different settings: Normal and Sport. Also, as part of the Toyota Gazoo Racing collaboration, the car has 19-inch forged alloy wheels with Michelin Pilot Super Sports tires, 13.7-inch front brake rotors, and four-piston Brembo brake calipers. Under the hood is where things get really interesting. As Jeff Perez of Motor1 points out, this car comes with a turbocharged 3.0-liter (L) inline six engine (courtesy of BMW) that’s capable of giving drivers 335 horsepower (hp). Equally impressive is its ability to reach 60 miles per hour (mph) in only 4.1 seconds, and that it has a limited top speed of 155 mph. In addition to all this, the Supra boasts an eight-speed automatic transmission. There are two trim levels for the newest Supra: Launch Edition, 3.0 and 3.0 Premium. The 3.0 version provides drivers with a 6.5-inch display screen navigated by a rotary knob. If you upgrade to the Premium version, you’ll get access to an 8.8-inch touchscreen that comes with Apple CarPlay, navigation systems, wireless phone charging capabilities, and a JBL surround sound system that boasts a 12-speaker setup. The Launch Edition (which is based on the Premium) comes in three different attention-grabbing colors: Renaissance Red 2.0, Absolute Zero White, and Nocturnal Black. Just because it’s a sports car doesn’t mean the Supra can’t provide drivers with the best in safety features. As Keith Estiler of Hypebeast points out, you can rest easy knowing you’re protected by systems such as forward collision warning, auto emergency braking, and road sign recognition. Additional safety features include automatic high beams and lane departure warning with steering assets. 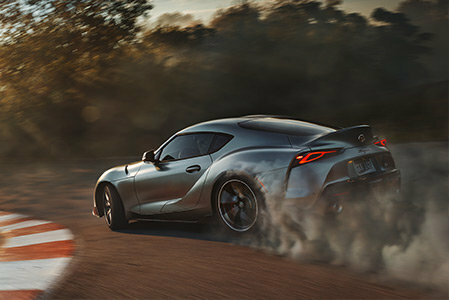 As you can see, Toyota has pulled out all the stops in bring the Supra back after its long absence. It’s a masterpiece that commands attention, and it’s definitely got ours! The 2020 Supra is slated for release in the summer and we’ll make sure to keep you updated with any new information that comes our way. Until then, why not pay us a visit at Westbury Toyota to see what else we’ve got to offer?